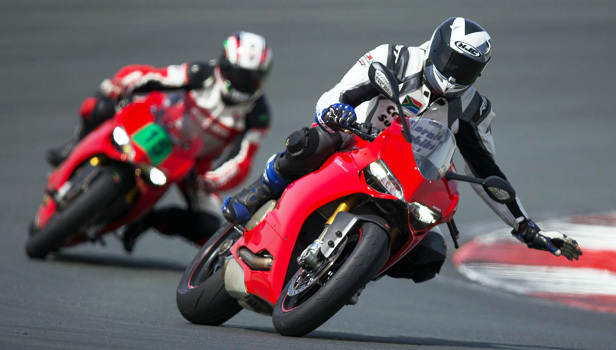 At SuperBike, we reckon that you never stop learning when it comes to riding a bike. That goes for good habits and bad, so it definitely doesn’t do any harm to head back to school every now and then for a top up, a tidy up and a check up. When it comes to track riding, there are millions (OK, lots) of people ready to give you their expert opinion, but not many schools have been running as long as the California Superbike School. Known for a very structured learning progress, the CSS puts thirty years of experience into its pupils to make them safer, faster and more confident. And now you can do all that on shiny red bikes from Ducati. Ducati UK has teamed up with the superbike school, supplying bikes for the instructors (lucky them) and a fleet of bikes for hire by pupils. You can choose from the 1199 Panigale, the 899 Panigale or the new Monster 1200. Prices for a day’s hire are £349, £269 and £249 respectively, with a £1000 deposit required in case you decide to go all Ruben Xaus on them. The school itself will cost you £409 – not as cheap as instruction on a trackday, but that’s like comparing an 1199 Panigale with a Chinese import scooter. Have a rumble over to the California Superbike School website by clicking here and check out what they’ve got to offer.